Jacopo Carucci (sometimes spelled Carrucci) and called Pontormo, was an influential artist in the 16th century style of Mannerism and also as a precursor to the later Baroque period. His training, though sometimes brief, gave him a sweeping influence of the time, including teachers such as Leonardo da Vinci (1452 – 1519), Mariotto Albertinelli (1474 – 1515), Piero di Cosimo (1462 – 1522) and prominently with Andrea del Sarto (1486 – 1531). 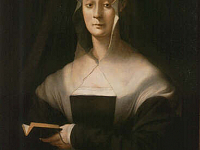 His work became an important influence on his prominent pupil, Il Bronzino (1503 – 1572). This breadth of influence formulated in Pontormo as a highly individual style, which helped define the development of early Mannerism, which would dominate the 16th century. His patrons in Florence where the Medici Family, giving even his early work a prevalent influence. 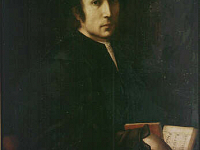 An early portrait by Pontormo, Portrait of Cosimo the Elder, is of the Medici Ruler, Cosimo de’ Medici (1389 – 1464), now at the Uffizi Gallery. One of his earliest works, Leda and the Swan, influenced by da Vinci’s own depiction of Leda, also hangs in the Uffizi. Though, the piece is still sometimes argued to be a work of Sarto or possibly Perin del Vaga (1501 – 1547). Of his other works now in the Uffizi are Portrait of a Woman with Splindes (1514), Portrait of a Musician (1518), Saint Anthony Abbot (1518), Madonna and Child with Saints (1520), Supper at Emmans (1525), Birth of Saint John (1526), Madonna and Child with the Young Saint John (1528), Martyrdom of Saint Maurice and the Theban Legion (1529) and another Medici portrait, Portrait of Maria Salviati, mother of Cosimo I.
Pontormo’s other well know commission from the Medici family was his masterful frescos in their Poggio a Caiano Villa in Prato, depicting Vertumnus and Pomona. 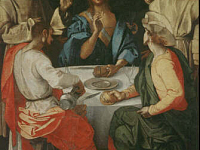 The work is an interesting historical lineage of Florentine art; the work begun by Pontormo’s teacher Sarto, continued by the artist himself and then completed by Alessandro Allori (1535 – 1607), who was trained by Pontormo’s pupil Il Bronzino. There were also several well known religious works throughout Florence’s churches by Pontormo, including his Deposition from the Cross and his Annunciation. Pontormo’s last works were also a Medici commission for the Choir frescos in their chapel in the Basilica of San Lorenzo in Florence. His only surviving works from this commission are his preparatory drawings. Additional to a detailed biography in Giorgio Vasari’s (1511 – 1574) The Lives of the Artists, Pontormo kept a diary in his last years. He is described as a melancholy artist, whose work reflected both passionate genius and unusual experimentation. This is embodied by his strong compositional skill, contrasted by his often contoured, Mannerist figures; the shinning example being his Deposition from the Cross.